I made a soup with similar ingredients to this many moons ago with a mile-long ingredients list, so this time around I decided to simplify it a bit more plus turn it into a casserole. As much as I love soup, sometimes I crave a bit more heft in the bite. I ALMOST made this inedible, as I had the Hungarian sweet paprika and cayenne pepper sitting side by side in identical containers during prep. I actually poured ONE TABLESPOON of cayenne pepper on top of the tomatoes, but praise be I immediately noticed my mistake and was able to scoop most of it out before stirring it in. The end result was still a tad spicier than I intended, but overall a great comforting meal for a cold night. It sure warmed my husband up, lol! And even though this is over an hour in the oven, I guarantee this is way less time than the traditional stuffed method! Preheat oven to 375 degrees. 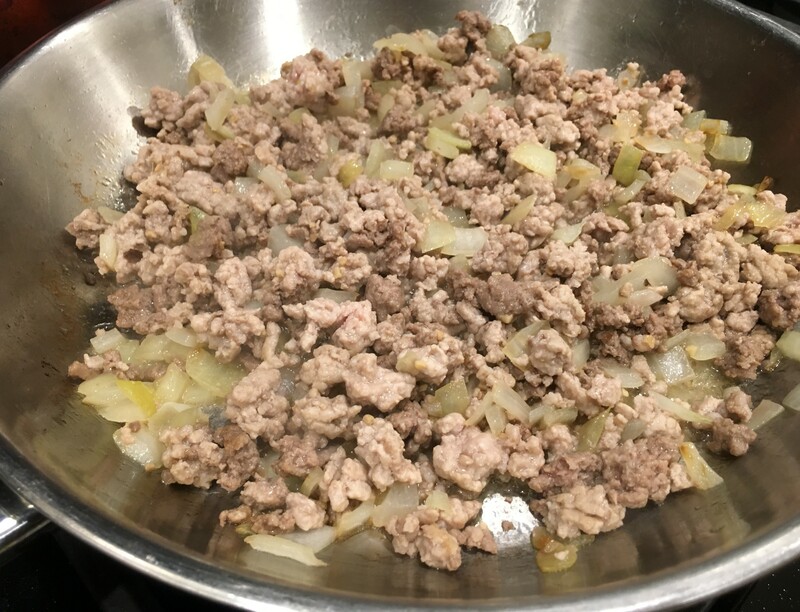 In a skillet, brown the ground ground meat and chopped onions in the olive oil over medium heat until meat is cooked through, about 10 minutes. 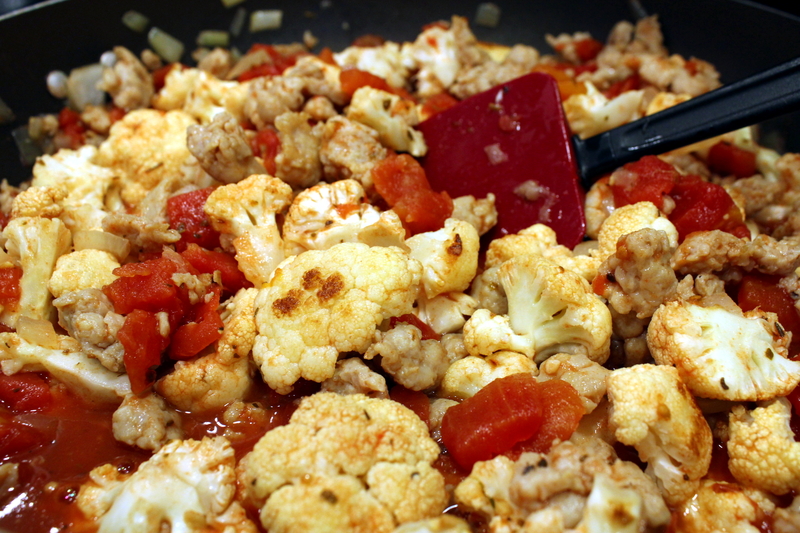 Add the minced garlic and cook a minute or two more. Drain the grease, if any. Grind a bunch of black pepper over it and add salt, to taste. Set aside. 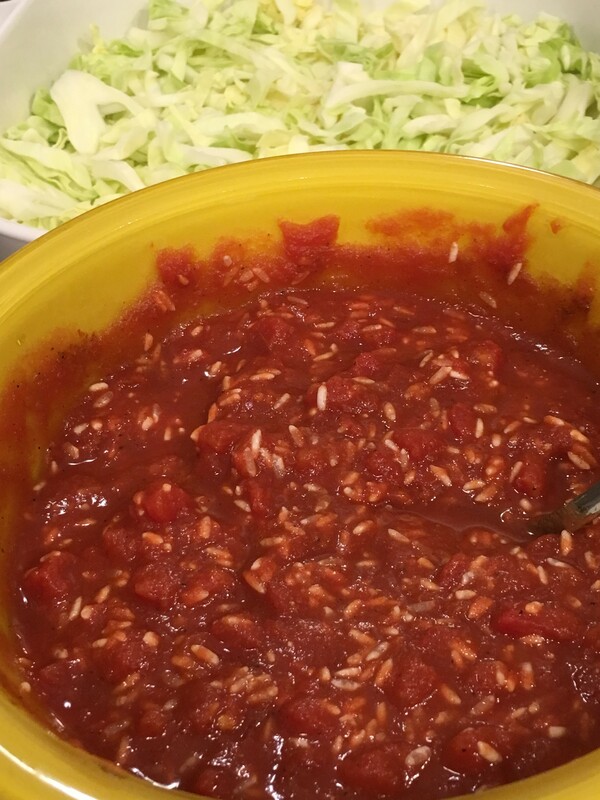 In a bowl, mix in the next 7 ingredients (diced tomatoes through the rice). 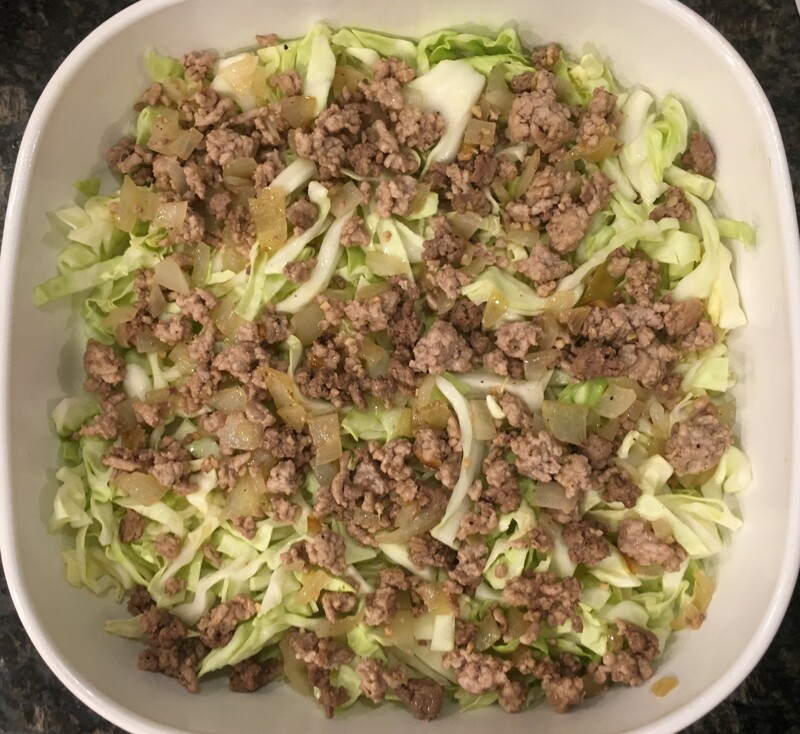 Lightly spray an 8 x 8 casserole dish with oil, then layer half the cabbage on the bottom. 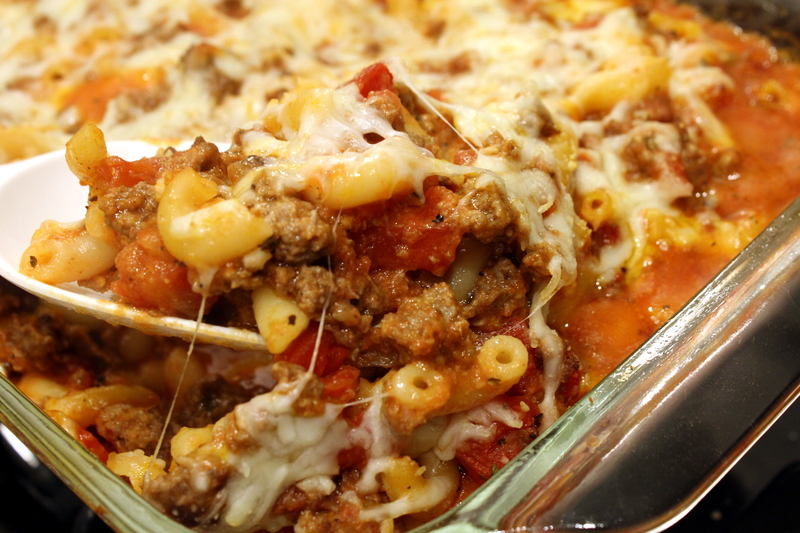 Top with half the ground meat mixture, then half the tomato sauce mixture. Repeat. Last, pour the beef broth over all. Cover dish tightly with foil, and cook in oven for 1 hour 15 minutes. Remove foil, sprinkle cheese over top and broil for just a few minutes to melt cheese. Remove and let rest for 5 minutes, then serve. p.s. 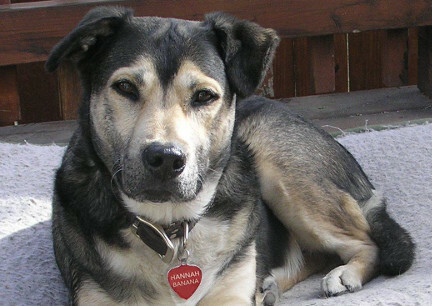 We had to say goodbye to our beloved Hannah Banana last week. 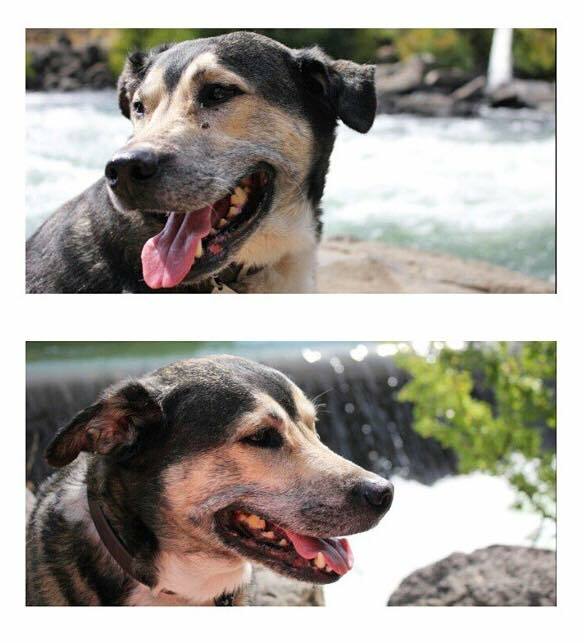 Our rescue dog of 14 years is deeply missed. We are in that “it’s hard to find a good vegetable at the store” time of year, so when the hubs asked me to pick up some veggies on my last trip, I settled on a spaghetti squash. After making this, I realized I had forgotten how much I like this beautiful squash! But is sure is a pain in the you-know-what to cut open. Most recipes for this showcase the innards in its lovely yellow shell as the serving container, but after my hack job it getting it open it was best left to throw it in a casserole dish. Aside from trying not to chop your fingers off cutting the squash in half and getting it baked, this is an easy dinner to prepare. 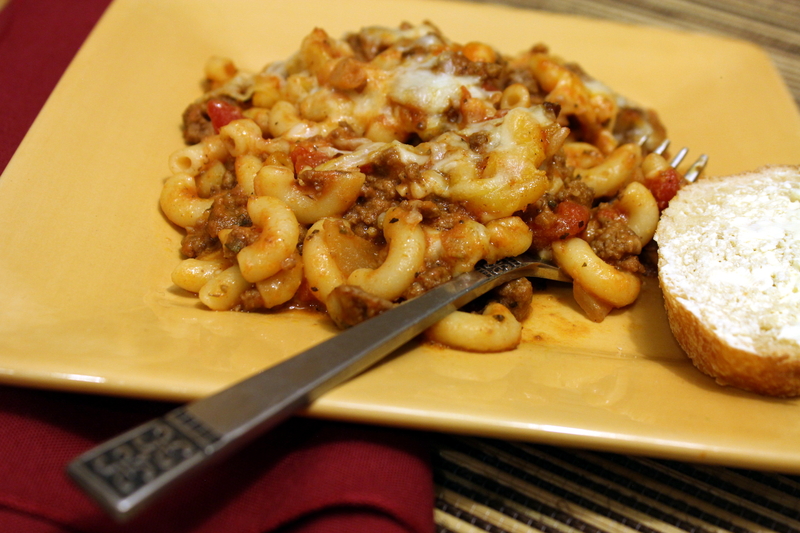 Serve with a salad and garlic bread, and dinner is served! Preheat oven to 400 degrees. Carefully cut spaghetti squash in half and remove seeds. Brush with olive oil, then salt and pepper it to taste. 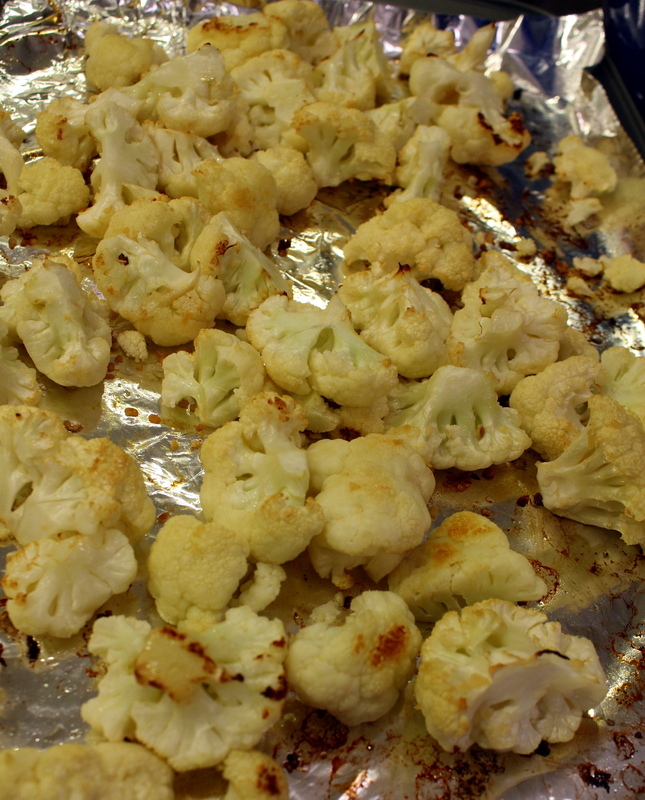 Place cut-side down on a baking sheet, and bake for one hour. 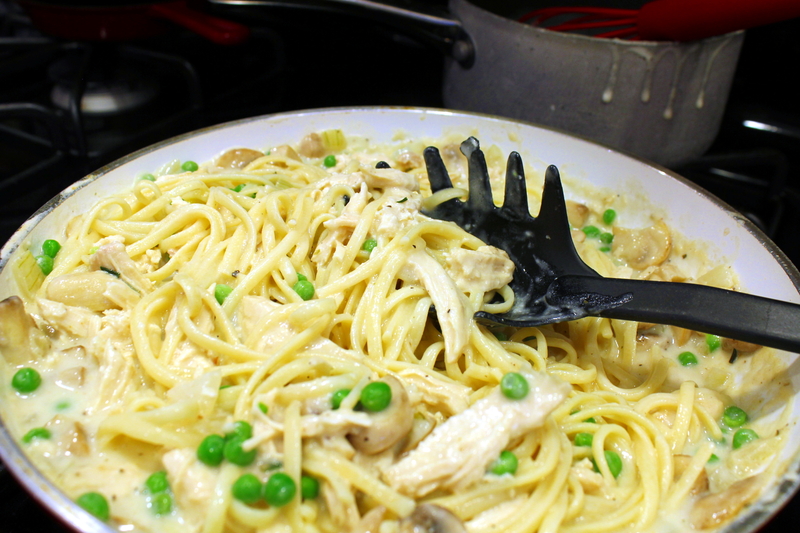 Let cool until you can handle them, then remove the “spaghetti strands” to a bowl, using a fork. Set aside and reduce oven heat to 350 degrees. About halfway through the squash cooking time, cook the Italian sausage in a large skillet along with the onions and garlic until the sausage is cooked through. 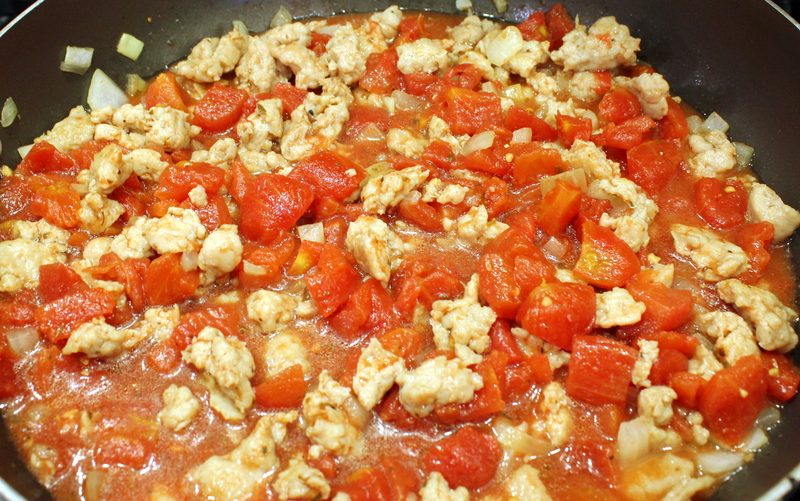 Add the can of crushed tomatoes and stir to combine, then reduce heat to simmer for about 20 minutes. 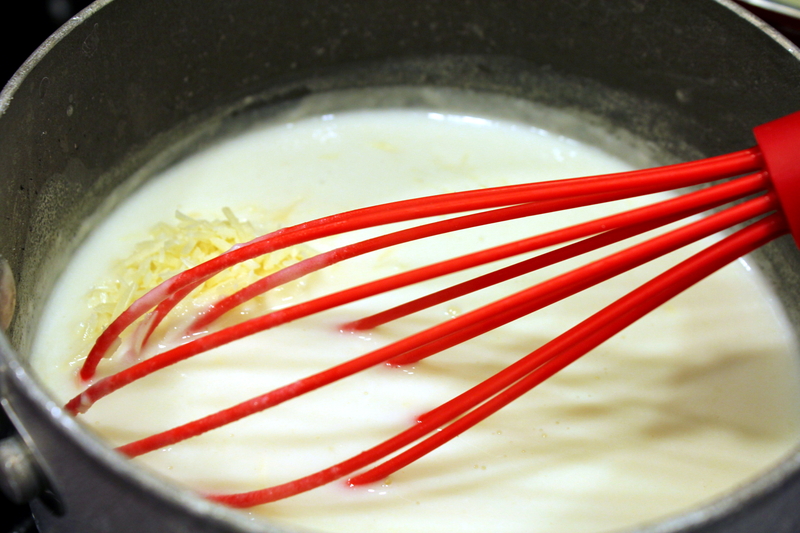 Meanwhile mix together the ricotta, Parmesan and parsley in another bowl. Once all the players are in place, stir the spaghetti squash into tomato sauce, then pour into a 2-quart oil-sprayed casserole dish. Spread the cheese mixture over top, then the mozzarella. Bake in 350-degree oven for about 20-30 minutes until bubbly and cheese is melted. Let rest for 5 minutes before serving. While Harvey was flooding Houston and other parts of the south, Oregon has been hell-bent on burning itself down. The air quality is downright nasty and unhealthy right now — and has been — for several weeks. But through that all our local farmer’s market still plugged on, albeit many vendors and shoppers short. And with the lack of shoppers came an abundance of fresh produce my way in exchange for some of my Austin Street Tacos, and equally as much free to take home at the end of the day. 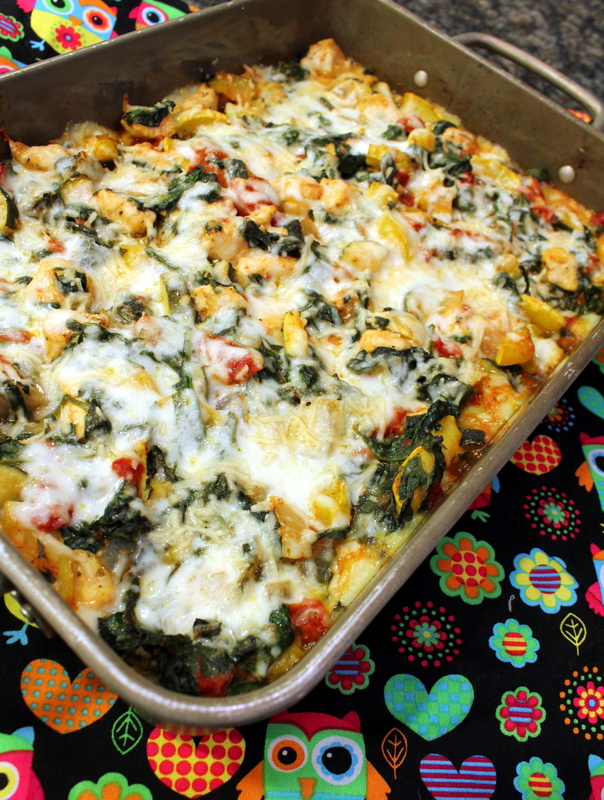 One of my dear blogging friends, Jodi over at The Creative Life in Between, had a perfect recipe posted on her site a couple of weeks ago that made the perfect candidate for some of the produce. While my time is short for blogging while running my cart, I did have a reprieve today to post this fabulous recipe as the concert I was going to sling tacos at tonight was canceled due to the smoke. I pretty much made this recipe as written, using ground burger and halved the recipe. I’ll just linky you over to her recipe, as she has a handy-dandy printable of it too! I know MANY of you have an abundance of zucchini out there, so please plan on adding this to the list of many things to make with it. It’s quite easy AND delicious! I’ve been on a self-imposed cooking haitus this week. I decided to scour the freezer for all the leftovers we had stockpiled in there from our snowbound two months, and discovered I had NO LESS than 8 meals in the freezer I decided we should heat up and eat before they were freezer burnt and long forgotten. I made a list on our fridge white board we usually use for our shopping list, and have been gradually eating them and wiping them off. I can’t help but make meals for 4 to 6 or 8 people (some kind of hangup from growing up in a family of 8), and with my daughter gone most of the time, we simply can’t eat the same meal more than two nights in a row (or sometimes every other night). Many of these just needed a side salad, bread, or veggies/potatoes. 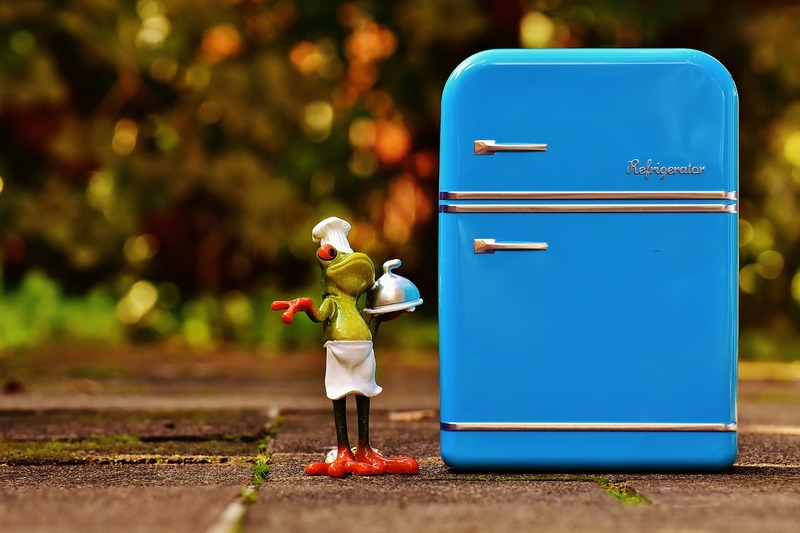 I have compiled for you my freezer list meals, along with links to the recipes for them. (Or similar recipes or part of one, and some are adaptations of prior recipes I’ve posted.) 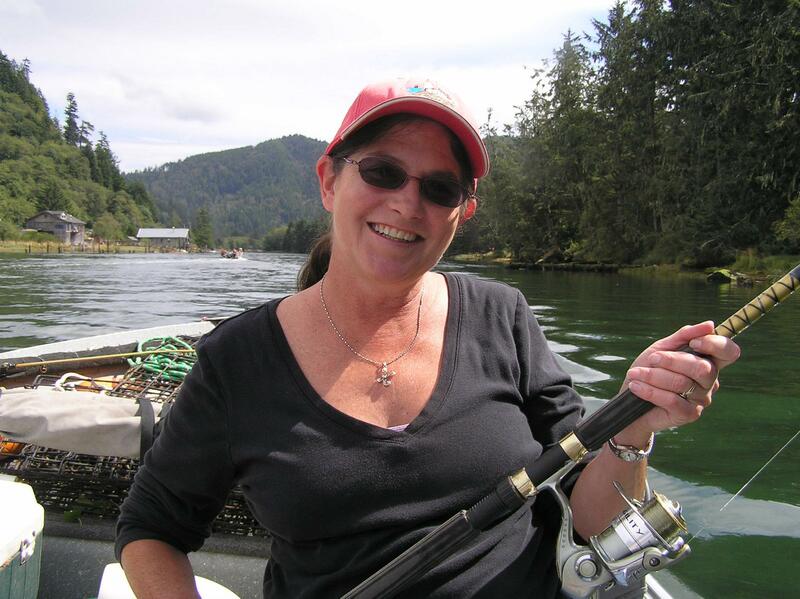 I’ll get back to more recipes and cooking soon! Enjoy! This freezes really well! Just as good, if not better later with loads more fresh-grated Parmesan cheese. A classic with a healthy twist. No canned soups! 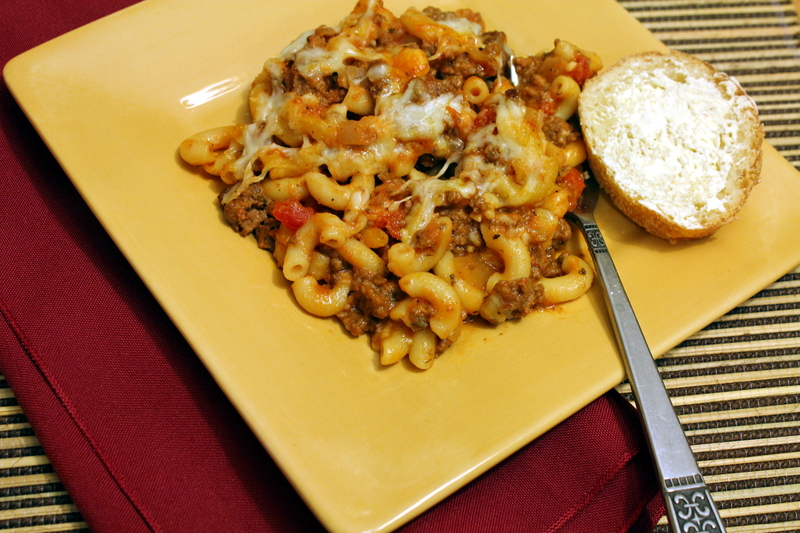 The version in our freezer was a wonderful meal made with shredded cooked beef that my husband made instead of ground beef, but similar concept. Another Italian-based soup recipe that freezes well and gets the same raves as the day you made it! I made this same type of soup, but used shredded chicken instead of ground beef. Try it, you’ll like it! Traditional roasted turkey leftover from New Year’s dinner, with gravy made from the turkey carcass stock. Here I give you the recipe for the stock. 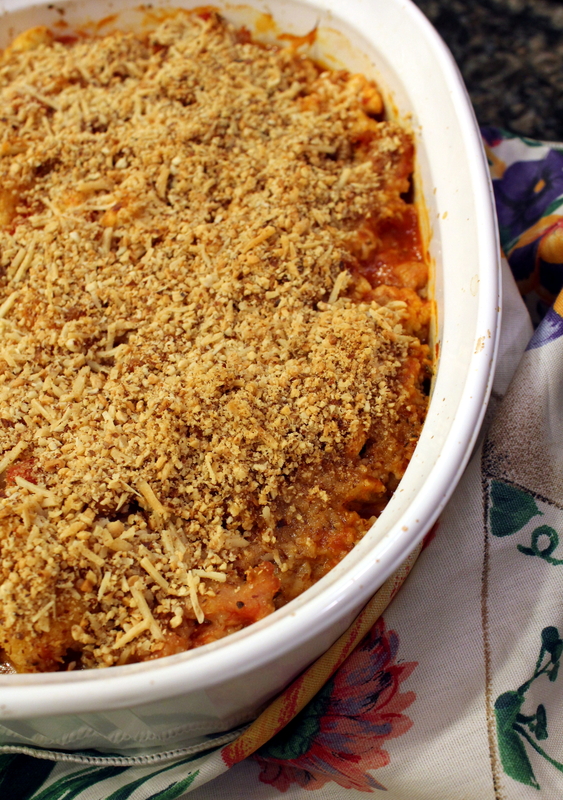 One of our favorite winter comfort foods. I know it’s many of my friend’s favorite too! 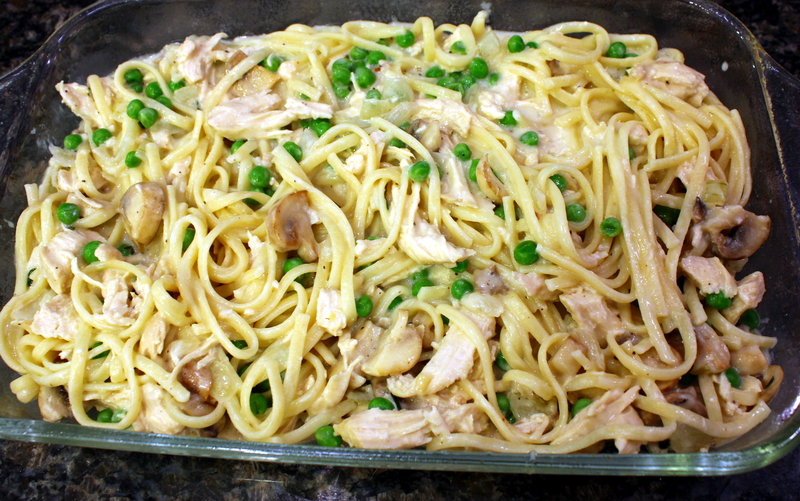 I used white beans instead of black beans for the leftovers in the freezer but I’ve posted both versions before, but this one has the printable PDF. I made this with a several pieces of ground up uncooked bacon in it and cooked via the sous vide method. Wow, talk about a flavor bomb! I am linking up to Conor Bofin’s recipe, as his inspired me to make my mom’s meatloaf with bacon and sous vide method. I did not write my own post about it. The last time I made chicken dumplings the hubs complained it was too soupy, so decided to make it into a casserole where it would thicken up nicely for him. Typically I would make this with celery in it, but since I didn’t have any and trips to the store are few and far between for me, I substituted some fresh mushrooms we had on hand instead. 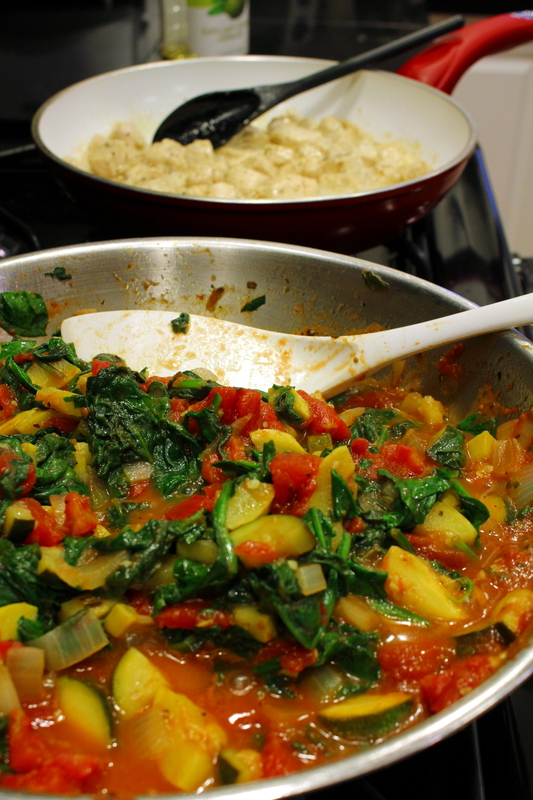 And to make it a tad fancier, I added some basil that I dried from my garden to the dumplings too. I precooked the chicken with my sous vide immersion circulator earlier in the day, but you can substitute rotisserie chicken instead. 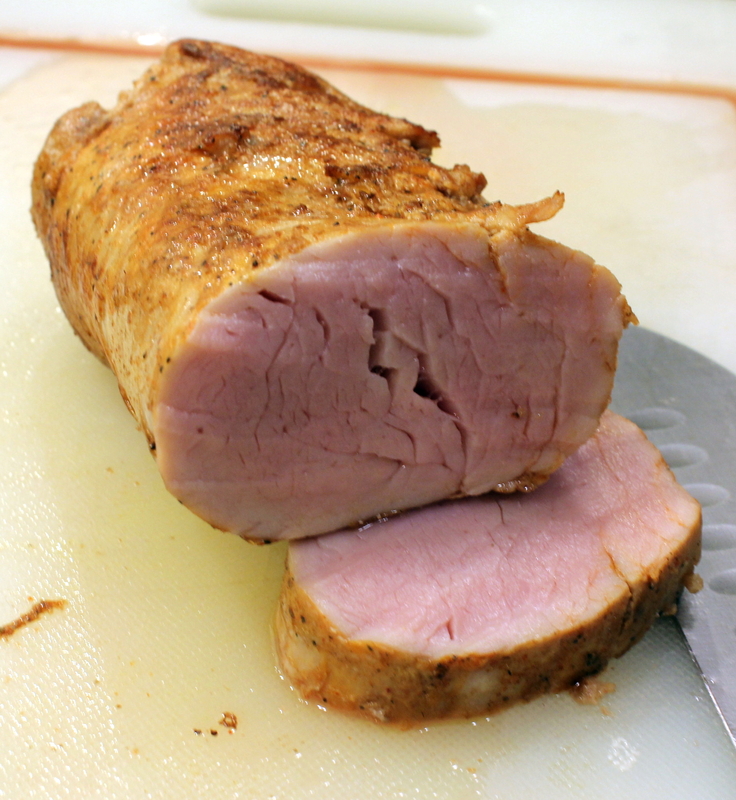 I have been experimenting with that cooking method and FINALLY cooked a pork tenderloin that was juicy and tender as any beef tenderloin you could have! Yes, pork is safe to eat when pink in the middle! My husband was a little put off by the pink, so he pan-seared his slices in a hot cast iron pot for a few seconds on each side. No sous vide recipe as of yet until I have a solid recipe for you. But back to the dumplings. 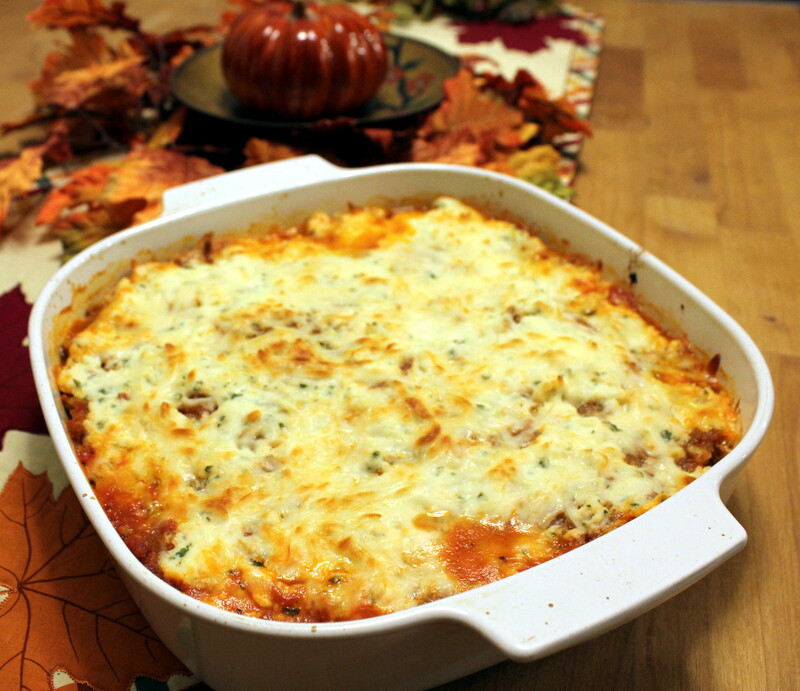 This is thick and hearty, yummy comfort food, perfect for welcoming in the winter! 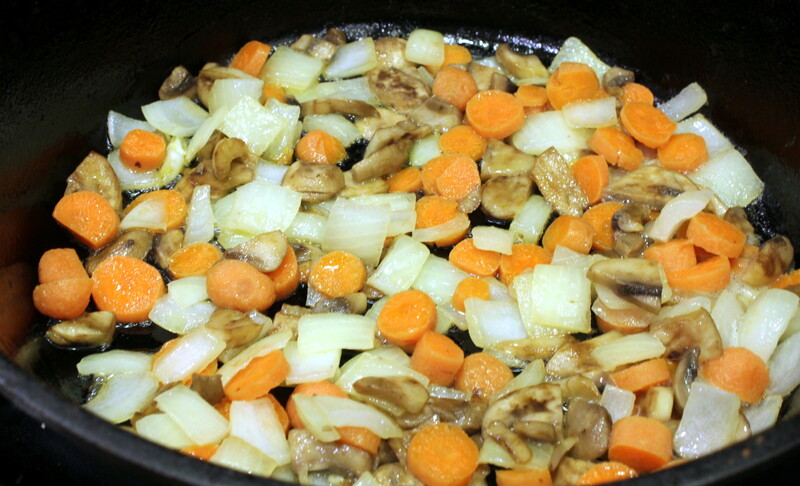 In a large skillet, sauté onions, carrots, and mushrooms in the olive oil and butter until tender, about 10 minutes. Add garlic in the last minute. Stir in flour, salt and pepper, basil and mix until blended. Add the chicken broth and bring to a boil, stirring constantly. 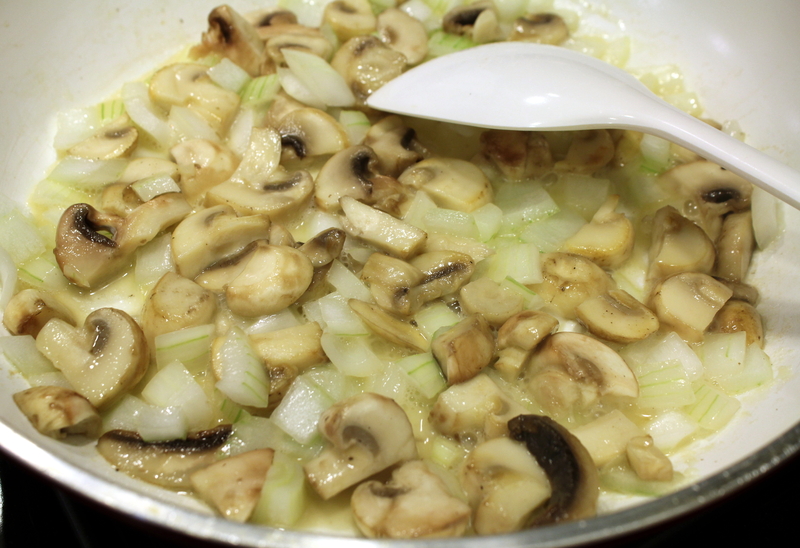 Reduce heat and simmer until thickened, about 5 minutes. 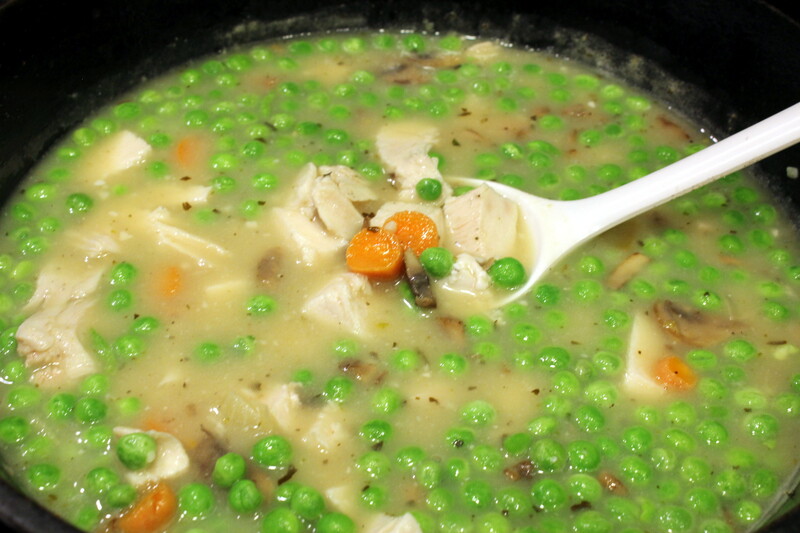 Add peas and chicken and mix to combine. 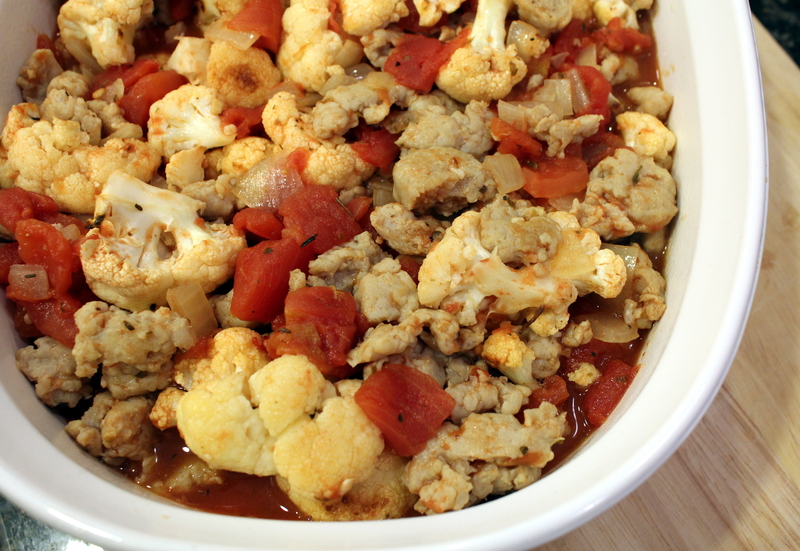 Pour into an oil-sprayed 2-quart casserole dish. 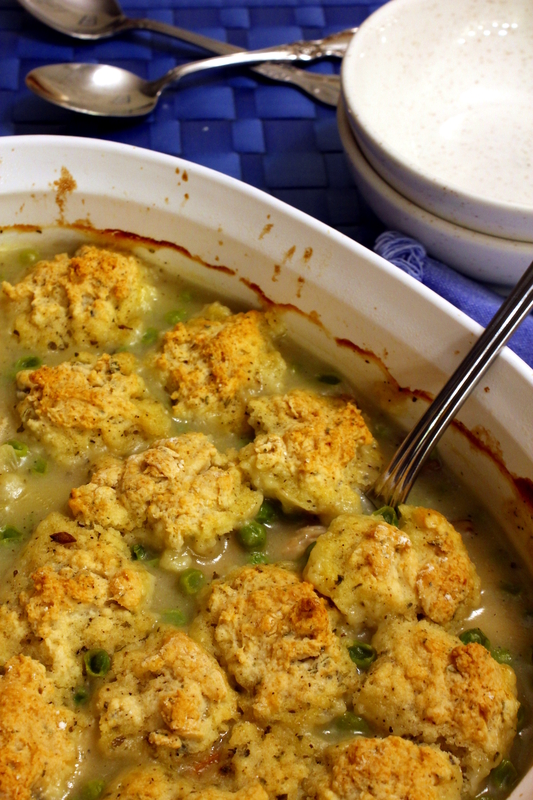 For the dumplings, combine baking mix and basil in a small bowl. 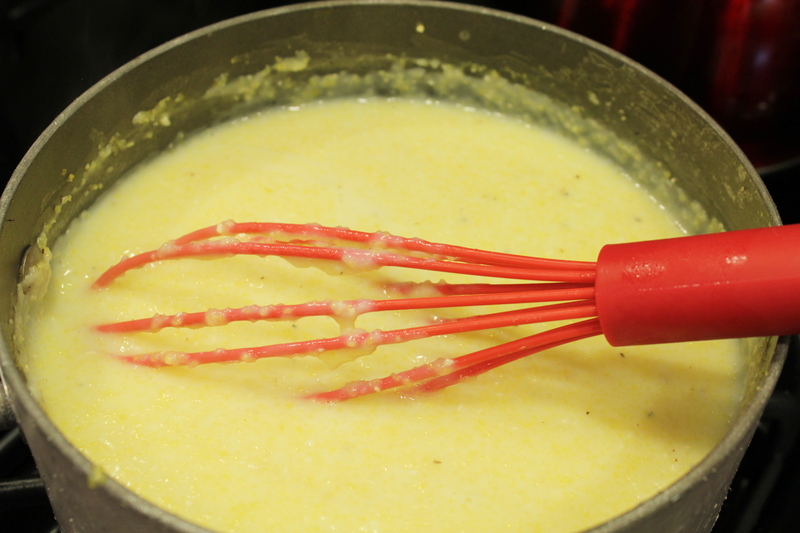 Stir in milk with a fork until moistened. 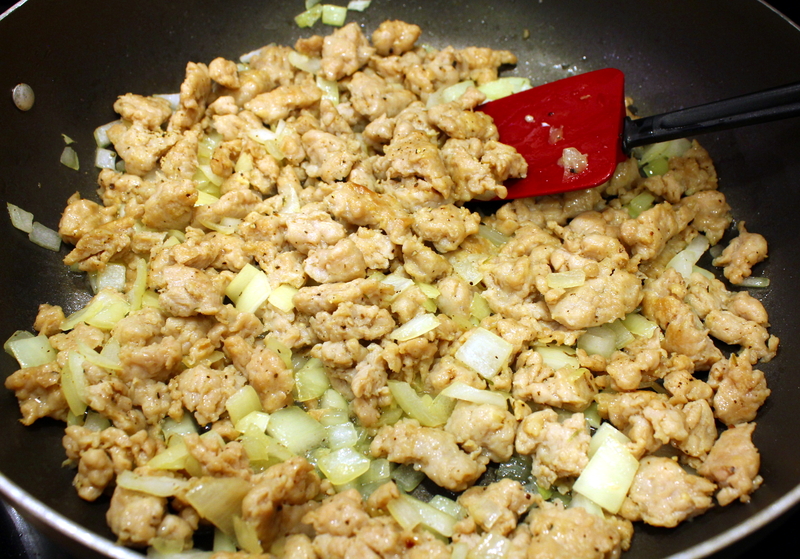 Drop by tablespoonfuls over the chicken mixture. Bake uncovered 30 minutes. Cover and bake 10 minutes longer. Serve in bowls with a side salad. The other event was too low of blood pressure, and I thought I would pass out so had to have my high blood pressure meds adjusted. The third event involved my daughter but she’s healing up nicely since an outpatient procedure. 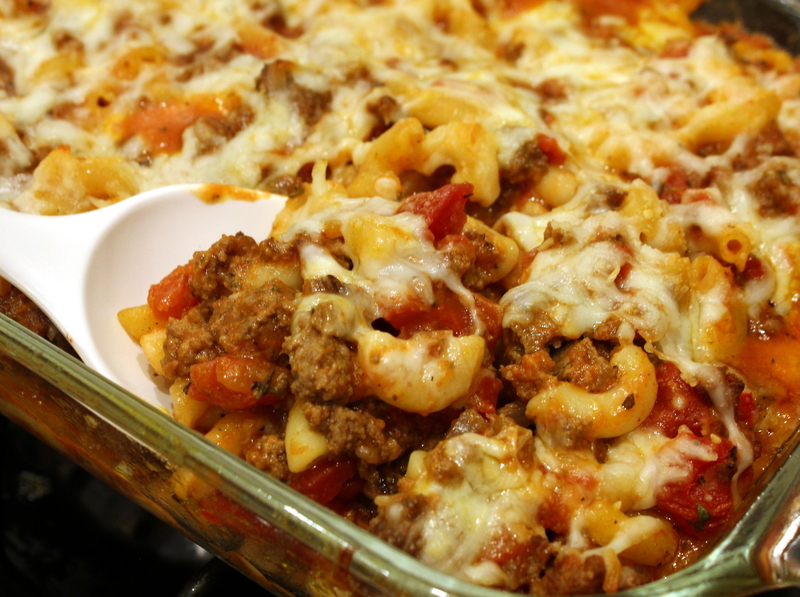 However, on the first day I felt well enough to cook, I dragged out my old stand-by recipe for this dish of Cheesy Baked Goulash. My daughter requests this often, and for my new readers, I am glad to share it with you. I am also fortunate to have a hubby that cooks and for takeout pizza, ha! Happy Spring! Preheat oven to 350 degrees and set a pot of water on to boil for the pasta. 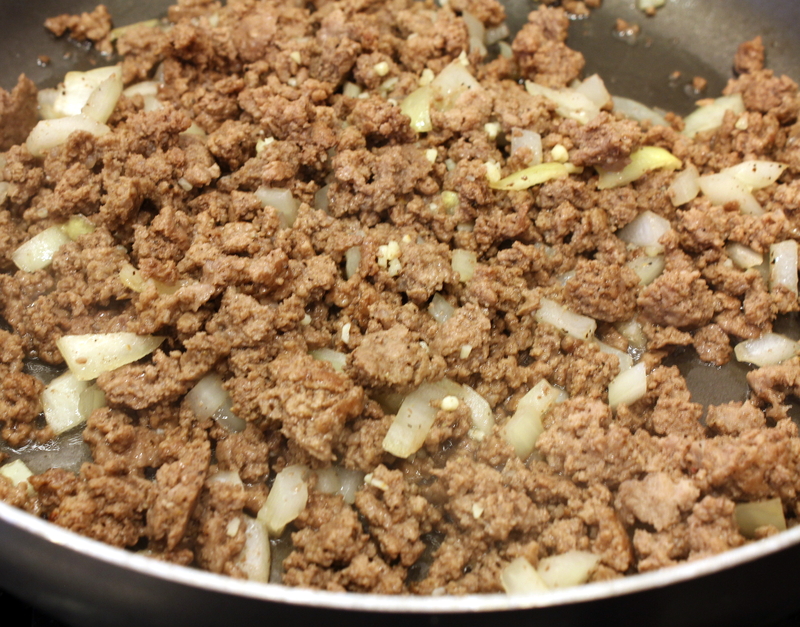 In a large skillet over medium-high heat, add the burger and chopped onions, then grind a bunch of black pepper over it. Cook until beef is browned and onions are translucent. In the last minute or so, add the minced garlic. Drain any grease, if needed. 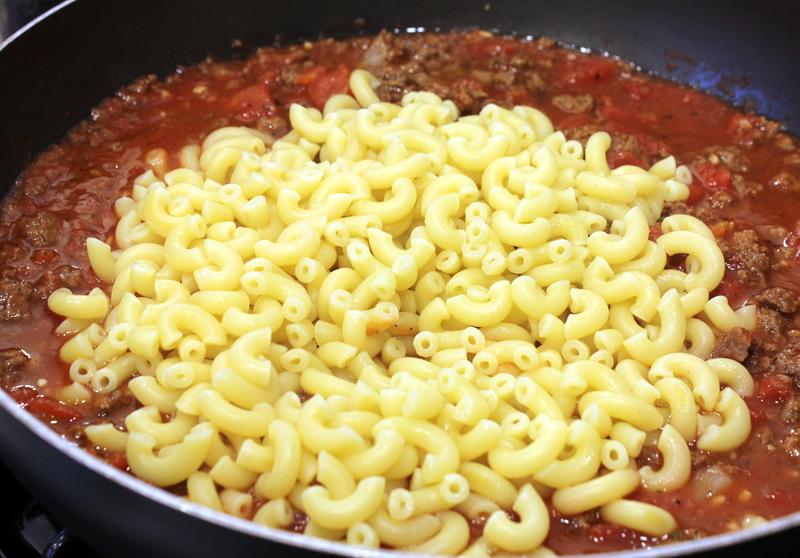 When the water is boiling for the pasta, add the macaroni and cook until just before al dente, then drain and set aside. It will cook more in the oven. 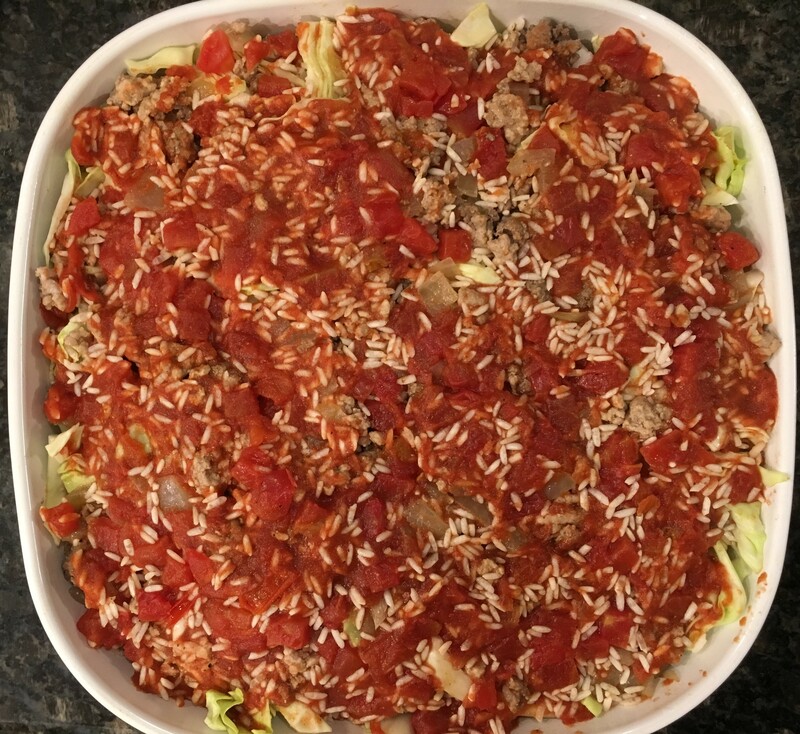 Meanwhile, add the tomato sauce, diced tomatoes, soy sauce, sugar, and herbs to the ground beef and stir to incorporate. Or you can be like me and forget the parsley until later. Next add the cheddar cheese (or perhaps parsley if you forgot) and mix until cheese is melted. 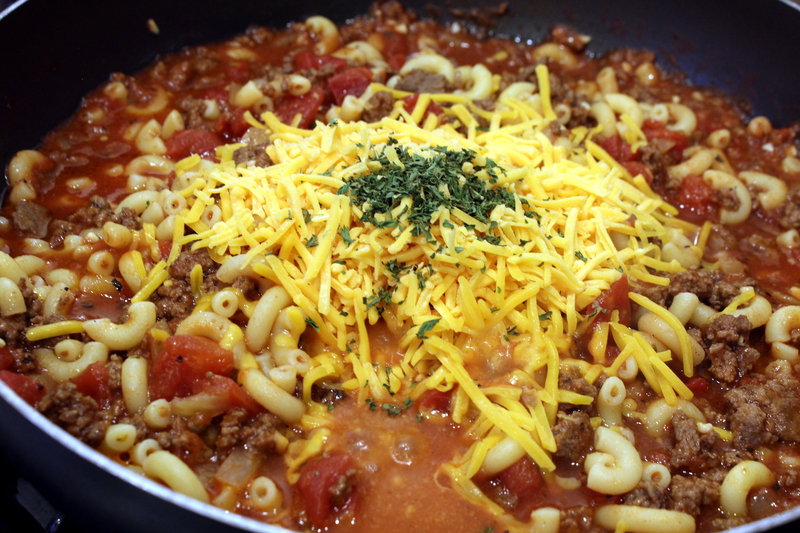 Stir in the cooked macaroni until combined. Pour into a 2-quart casserole dish sprayed with oil. 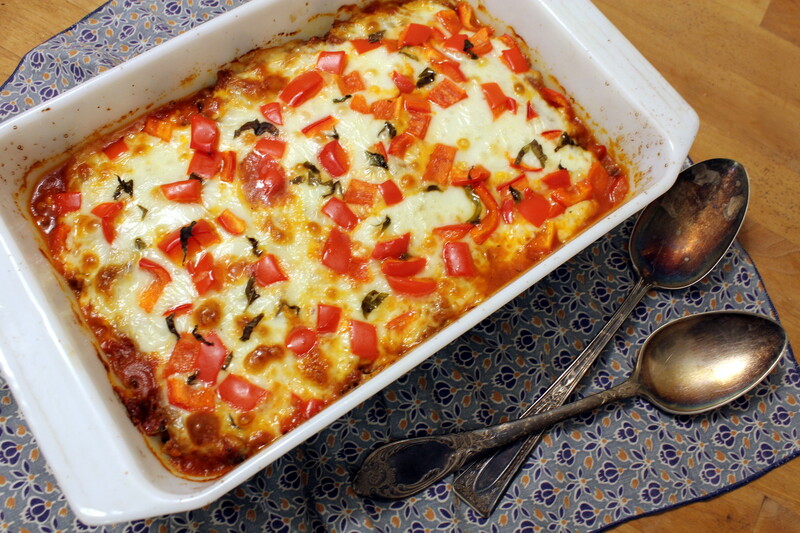 Top with the Mozzarella cheese and bake for 30 minutes. Let rest about 5 minutes, then serve with buttered bread, and a salad if you want. I hope all my wonderful friends and family have a blessed Christmas and a bright 2016! 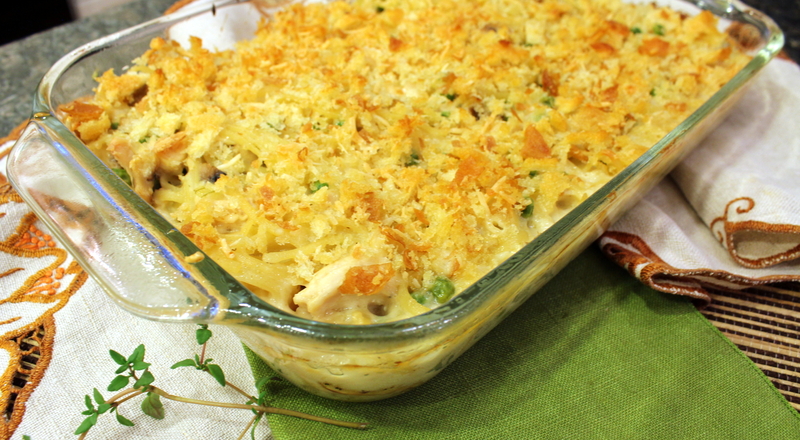 I’ll be making my traditional egg casserole again tonight, but with a couple of changes. I’ll prep the hash browns and sausage as normal, but leave the whisked eggs covered in a bowl, and add them and the cheese in the morning just before popping in the oven. My hubby thinks it will come out a little less dry, and I agree with him! Oh, and I’ll be mixing half breakfast sausage and half chorizo sausage, both homemade! I’ll have to get those recipes up here one of these days. 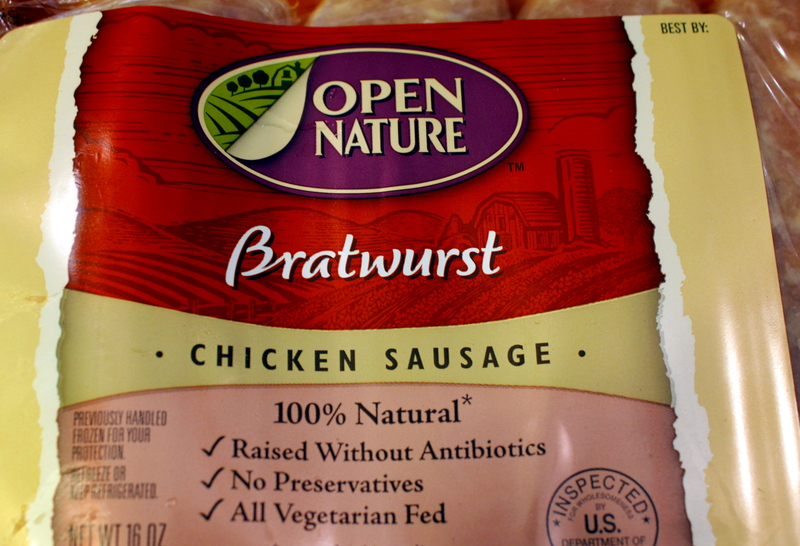 I had the defrosted chicken breast and a fresh bag of spinach, and set my sights on something new for the combination. I have made my Balsamic Chicken and Spinach more times than I can count the past few years. 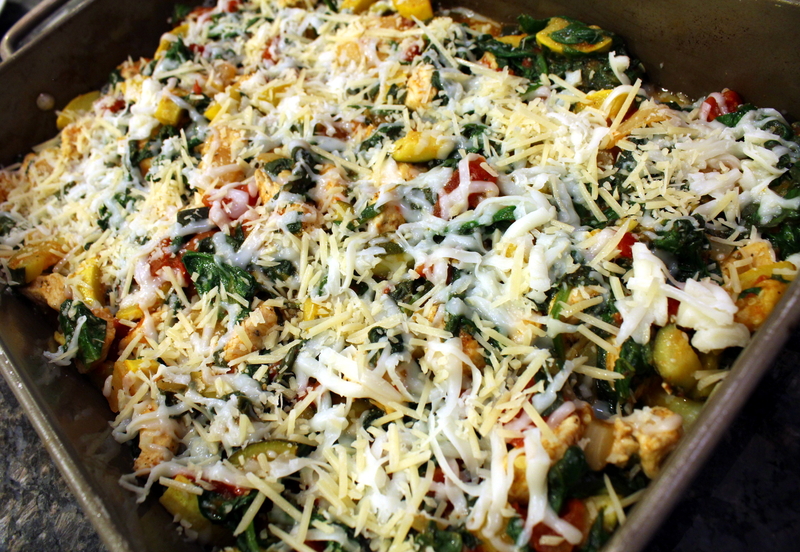 Somehow I came across some vegetarian polenta and spinach casserole recipes, and tasked myself with coming up with a recipe my family would actually eat. 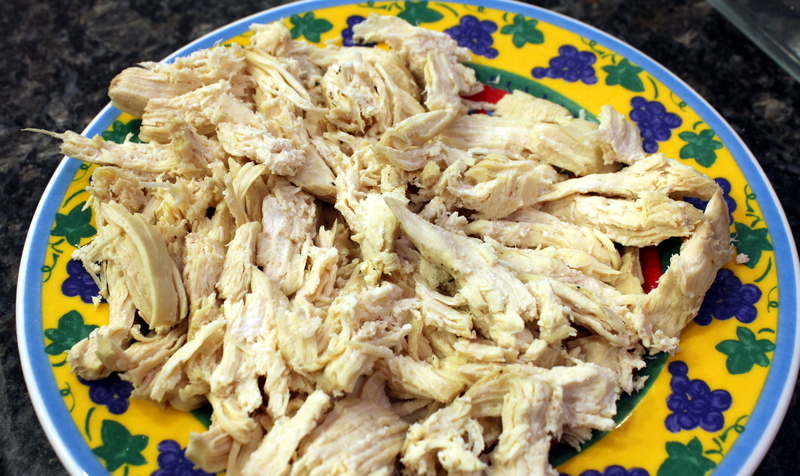 Cut the chicken into bite-sized pieces and season to taste with ground black pepper and salt or Mrs. Dash. Heat a skillet with the 1 tablespoon of olive oil over medium heat and brown the chicken about 5 to 7 minutes, stirring often. Set aside. 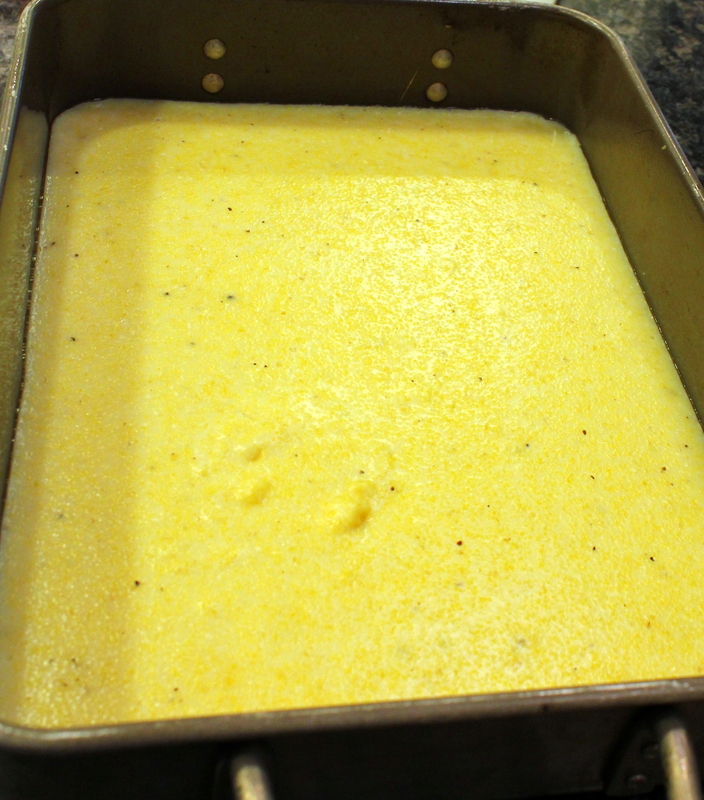 When the polenta is done, pour it into an oil-sprayed 13 x 9 or so sized casserole dish and set aside. Meanwhile, add the 2 tablespoons olive oil to a skillet over medium heat. 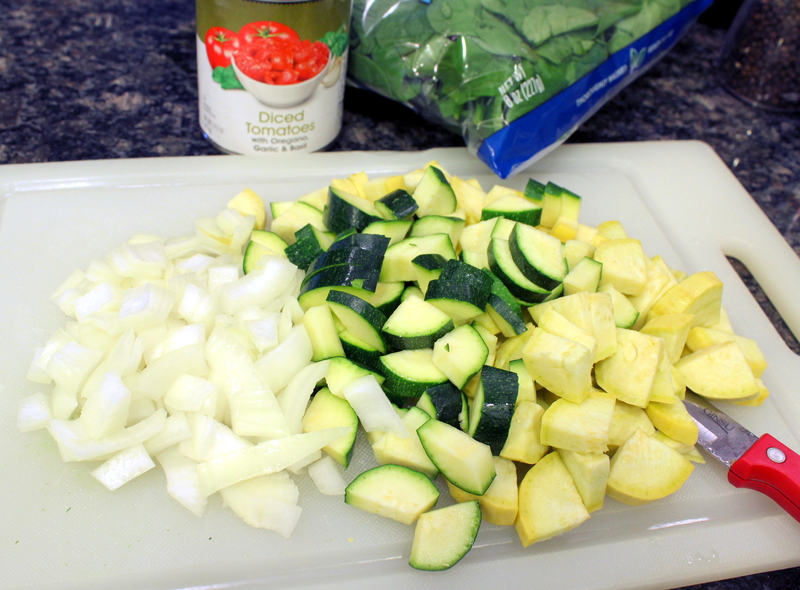 Add the onion, garlic, zucchini, and squash and sauté until the onions are softened. Add the tomatoes (and spices if tomatoes aren’t pre-seasoned). Bring up to a simmer for 10 minutes. Add the browned chicken and mix to combine. Now, by handfuls, tear up the spinach and add to the mixture and stir in until all is added and wilted. Spinach Wilting into Vegetables ~ WAIT ~ You don’t see that forgotten chicken in the background you had to cook first, right?? Meanwhile (again), preheat the oven to 350 degrees. 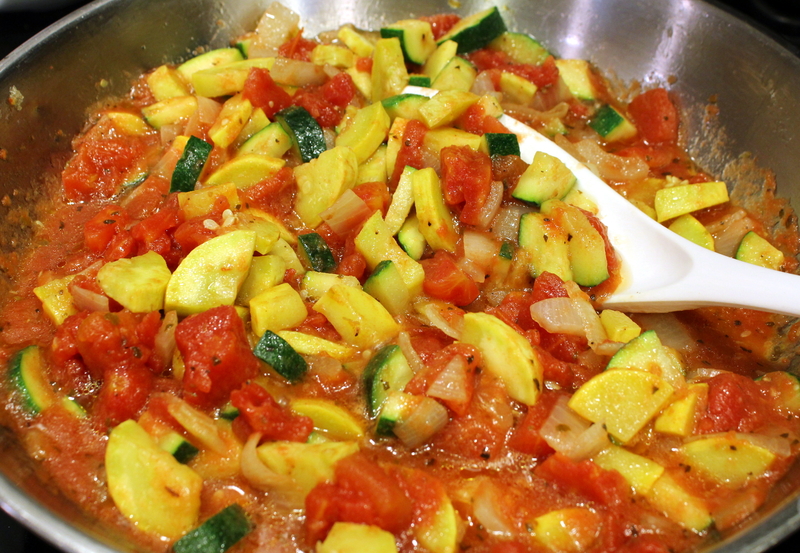 After the vegetable mixture is done, spread it evenly on top of the polenta in the casserole dish. 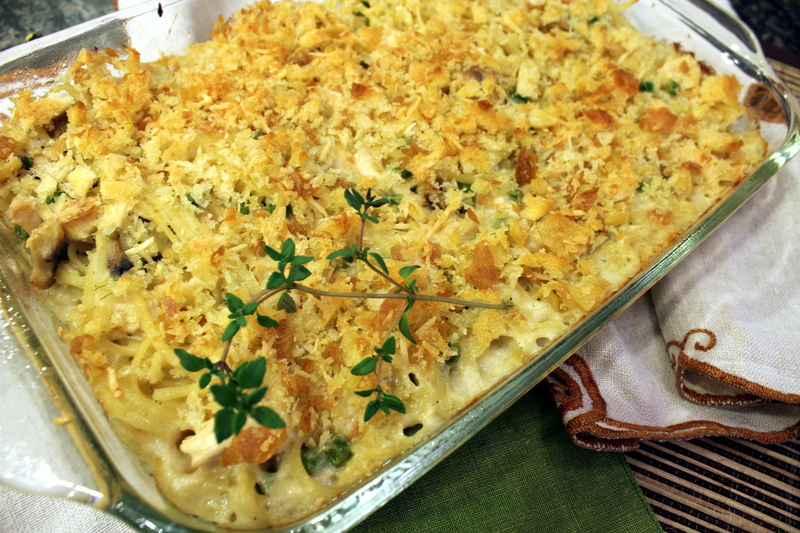 Top with a combination of shredded Mozarella and Parmesan cheeses. Bake for about 25 minutes until it is heated through and bubbly and the cheese has melted. Turn the heat up to broil and broil for 5 minutes. Take out of oven and let rest for 5 minutes. Serve on plates or in bowls. Nothing else is needed, as this is an entire meal! 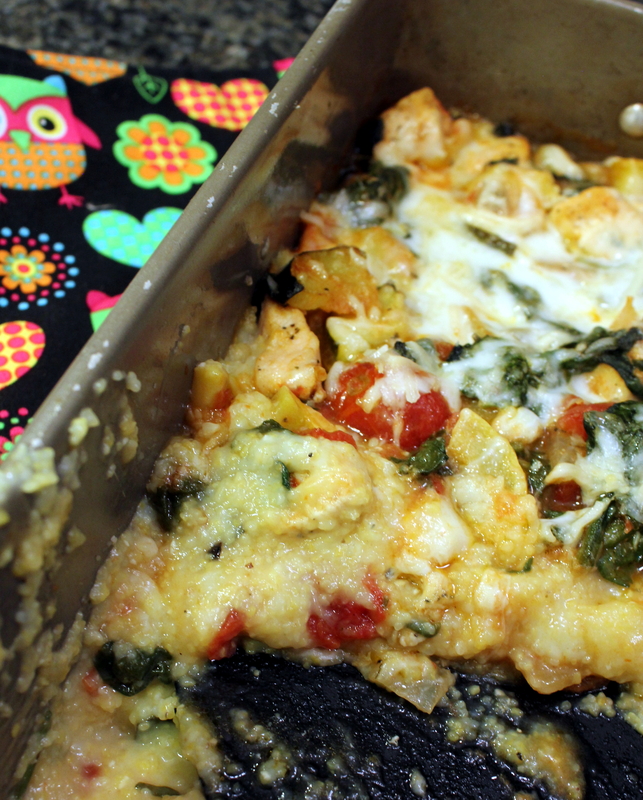 If this weren’t so fugly coming out of the casserole dish, I’d call it guest-worthy (taste-wise)! 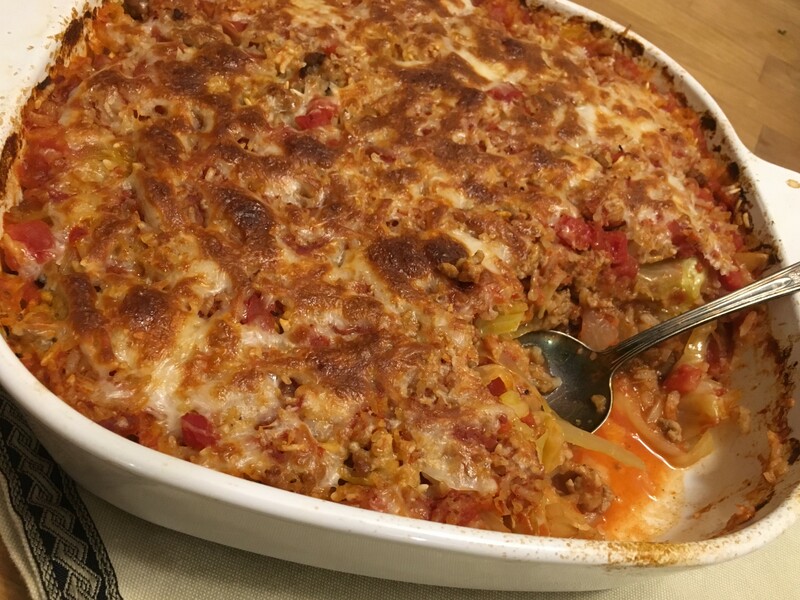 Casserole Half-Eaten~ YEP! 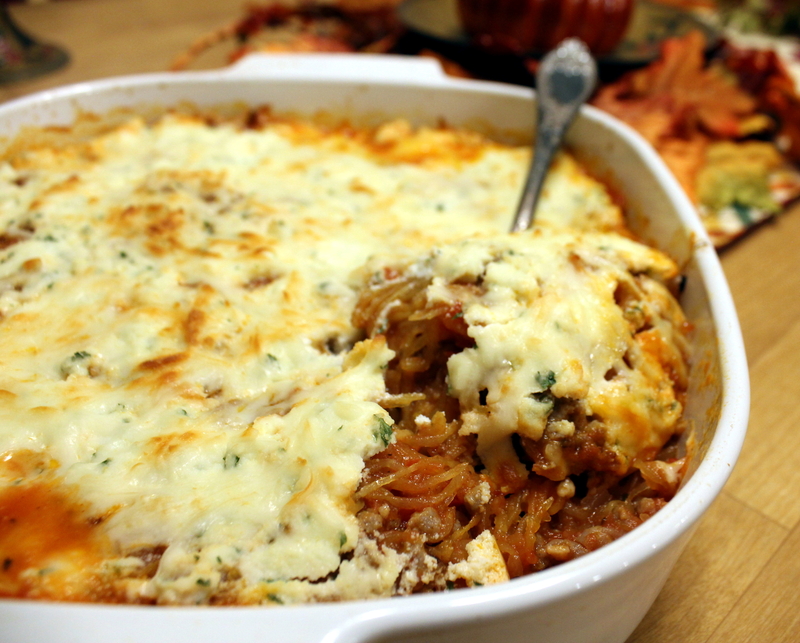 Three of us pretty much wiped out half of a lasagna pan of this in one sitting!